3 Comments	This post may contain affiliate links. 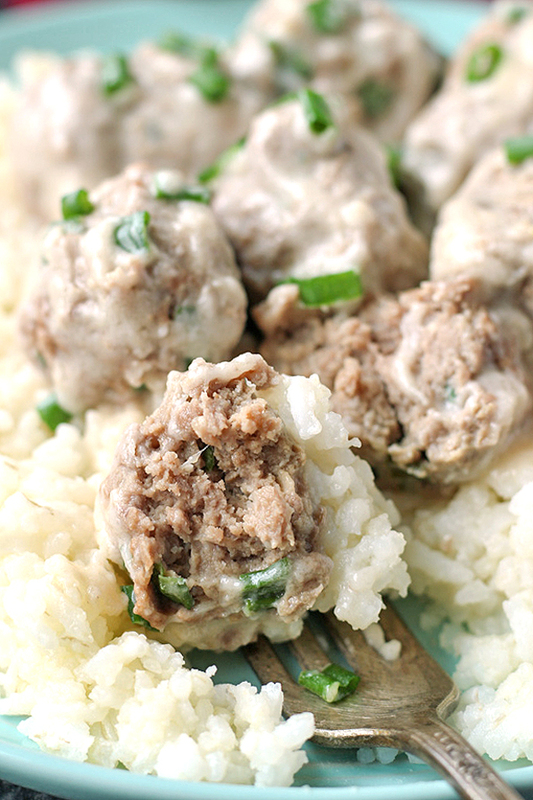 These Paleo Whole30 Meatballs with Creamy Sauce make a great week night meal or holiday appetizer. 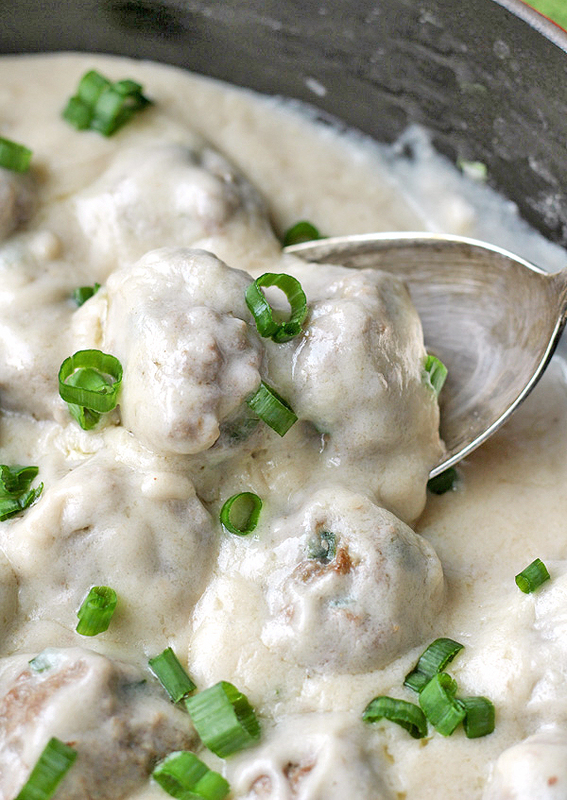 The meatballs are juicy and the sauce is thick and creamy. 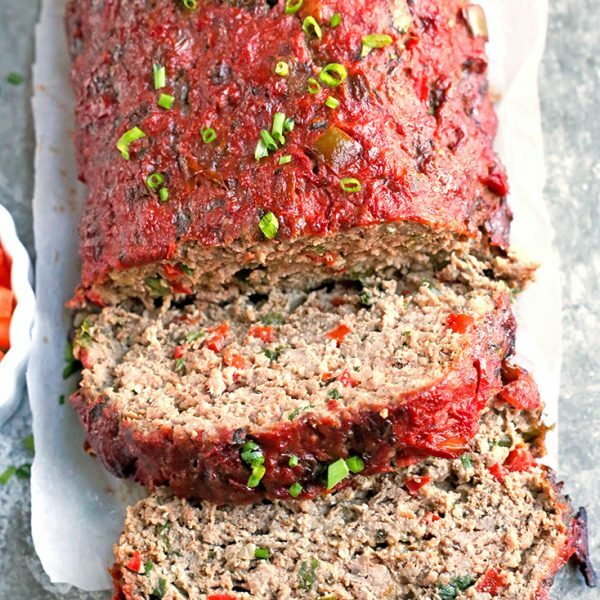 Gluten free, dairy free, low fodmap and so delicious! My Easy Oven Baked Paleo Meatballs are a super popular recipe and I thought it was time for a new one. 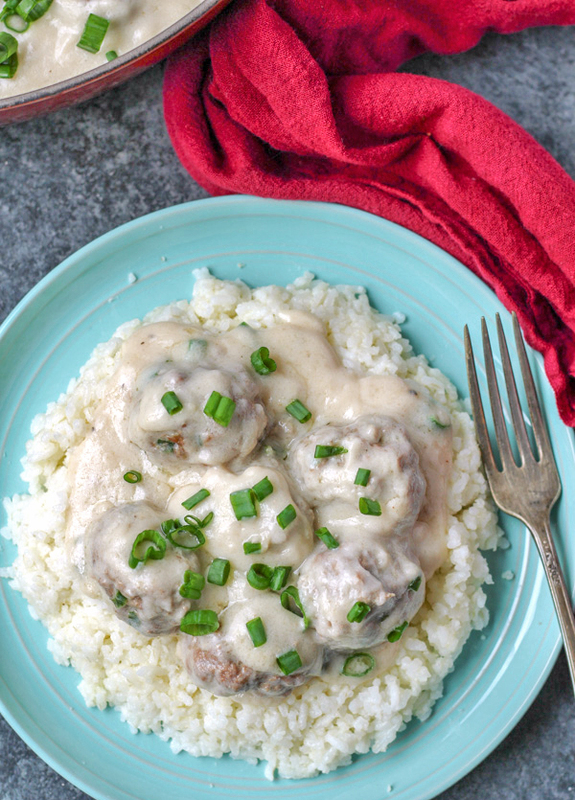 This one is just as easy, but different in the fact that they’re made with all beef, bake a little less time, and are covered in a creamy sauce. 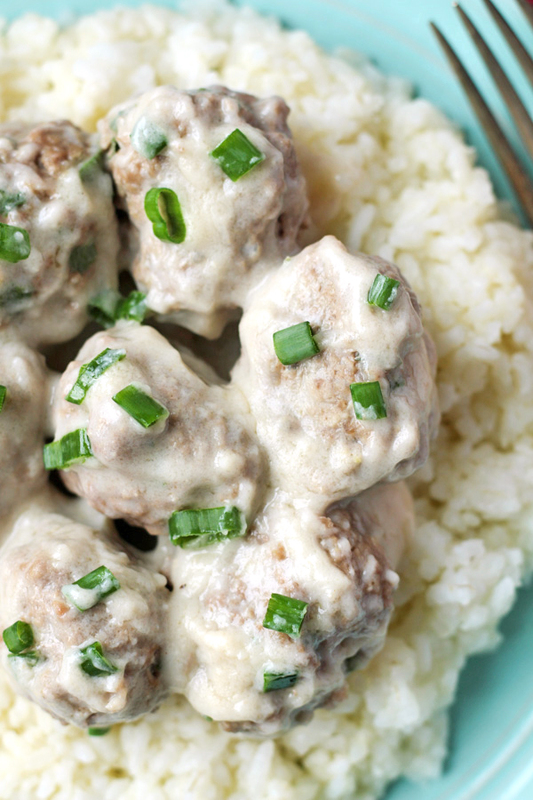 Let’s talk about the meatballs first. 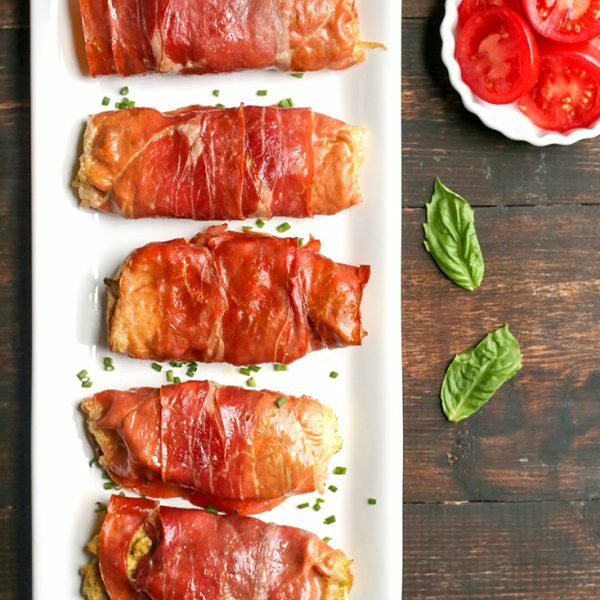 They are moist, tender, and so easy! All the ingredients are mixed in a bowl, scooped onto a pan, and baked. The green onion and garlic oil add so much flavor and they are even good plain. They are gluten free thanks to the almond flour. Now the sauce- it’s just as simple and based on my Paleo Gravy recipe, but made with Malk for more creaminess. 4 ingredients, a few minutes, and done! Put the cooked meatballs in the pan, coat them with the sauce and you have a quick and easy meal that’s packed with flavor. 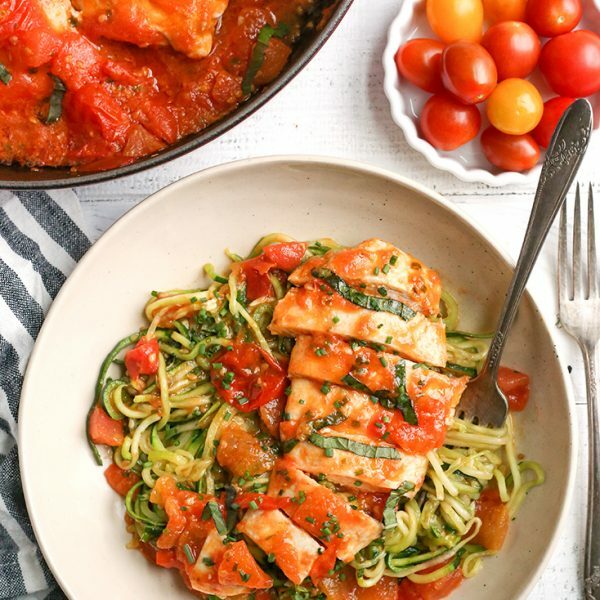 This meal is Whole30 compliant- serve with some cauliflower rice or a side of veggies. There is rice in the pictures because we do eat it. If you’re not doing a Whole30 you should try them over white rice- so good! 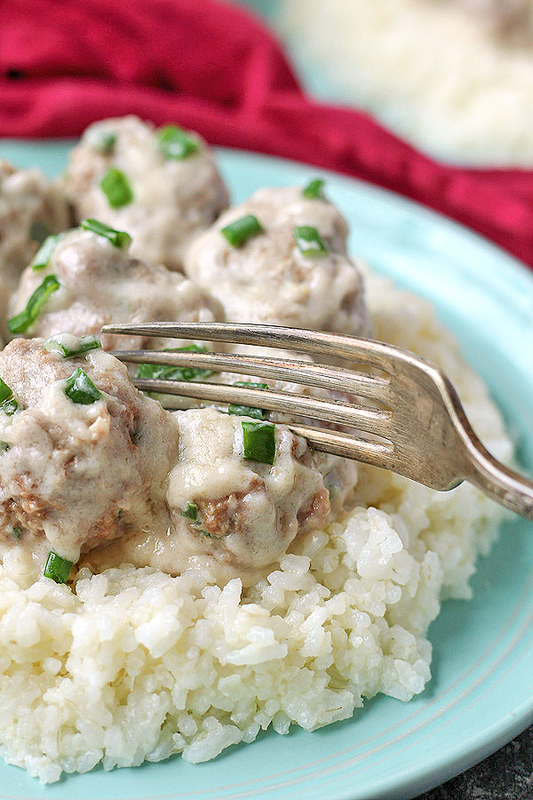 These meatballs would also be good served as an appetizer at a party. I know there are a lot of holiday parties and entertaining this time of year and these would be perfect. Make them, keep them on low on the stove, and let people serve themselves. 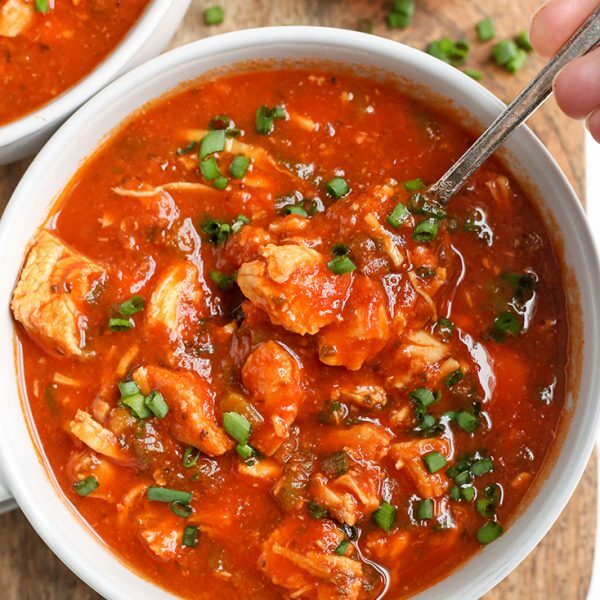 This is a pure comfort food meal that the whole family will love. Preheat the oven to 350° and line a sheet tray with parchment paper. Set aside. 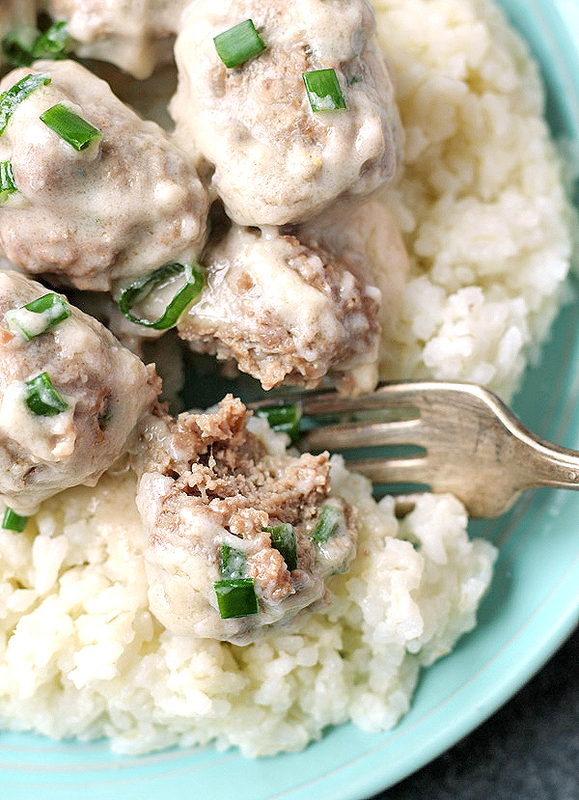 In a large bowl, combine ground beef, green onion, garlic oil, egg, salt, almond flour, and coconut aminos. Mix well. I find the best way to do this is with your hands. Once fully mixed, scoop into balls. Should make 30 meatballs. Use a cookie scoop for even size balls. Scoop, roll between your palms, and place on the sheet tray. Bake for 18 minutes. While the meatballs are baking, make the sauce. In a large saucepan, combine ghee, and cassava flour over medium heat. Stir until fully combined and cook for about 1 minute, stirring the whole time. Whisk in almond milk. I used 3 cups for lots of sauce, but you can use 2 for not as much. It should take about 3 minutes for the sauce to thicken. Add salt and pepper to taste. 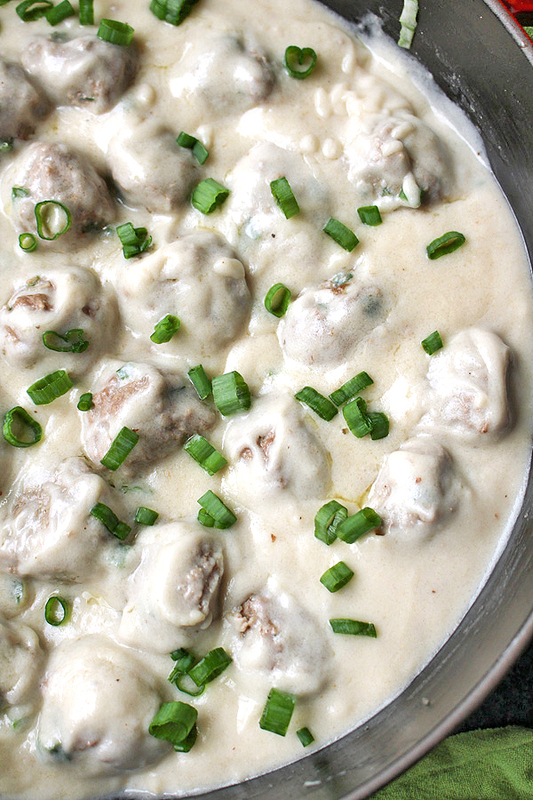 Remove the meatballs from the oven and scoop them into the sauce. Cover them fully with the sauce and serve. Looks great! I don’t have cassava flour, but could you suggest a substitute?